The word stress in English originally meant "stress, tension". In many languages ​​(including Czech), the word stress has become a synonym for psychic stress at a stage when it is already unpleasant - mental stress in the exhaustion phase. This text does not deal with acute mental stress. If you are interested in herbs for mental stress, look elsewhere . Jánosz (Hans) Selye introduced the word stress into the general consciousness in 1936 by the article "A Syndrome Produced by Various Nightuous Agents" ( Nature ). Selye generalized the theory of stress and described the so-called generalized adaptation syndrome - a non-specific hormonal reaction by which the mammalian organism reacts to various stressors uniformly by spilling adrenaline, noradrenaline and cortisol . Cortisol is considered to be a stress hormone. Adrenaline (epinephrine) and noradrenaline (norepinephrine) are known as the hormones of attack and escape. Because the new broom was well suited, Selye understood in these heroic days of scientific progress that the norms of physiology and medicine could be generalized like physics laws. It's going to make a certain change in meddling medical thinking, but it's possible. Selye, therefore, has sought to develop a better definition of health, homeostasis, stress, adaptation range, and so on. In doing so, he created the basics of the science sector, which he called the unified theory of medicine . It is a complex, though problematic theory - as well as evolutionary theory in biology, where we have defined definitions of fitness, evolutionary pressure, genetic drift, and so on. The benefits of Selye can be chanting long, as is the case with Szabo2012lhs , but the truth is that in the 20th century, after Selye's departure, theoretical medicine as a branch did not develop. Selye became known for his experimental discoveries (cortisol), and his contribution to theoretical medicine remained largely unnoticed until the 21st century. Let us recall that the concept of adaptogen belongs to the field of theoretical medicine as well. 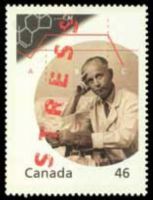 Portrait of Selye on a Canadian postage stamp. 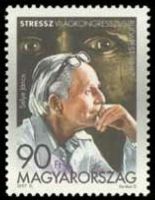 Portrait of Selye on a Hungarian postage stamp. non-specific stress response - is the same for each type of load. Example: Whether it is a desert march, a glacier, a marathon run, or an argument with a boss, the result is activation of the stress axis and elevation of cortisol. Another example: Whether the cell is damaged by heat, radiation, poisons or other stressors, the result is the expression of repair proteins - chaperons. Phase Alarm - Acute Stress Response. Example: After seeing the predator, we get wet, we get hairs, adrenaline and noradrenaline are released and we are ready to attack or escape. the stage of adaptation - phase, when our strength is enough to handle the stressful situation. Example: The Marathon runner runs at a speed of 20km / ha and can last so long. the depletion phase - or so-called decompensation. Example: A non-trained man running away from the predator after several hundred meters will lose his breath and fall into a state of exhaustion. Another example: After 1 hour of staying in cold water, an untrained person suffers decompensation and threatens to suffer death by subcooling. While adrenaline (epinephrine) and noradrenaline (norepinephrine) are typical of the first (alarm) phase of the stress reaction (falling into cold water, inappropriate arrival of a police officer, etc. ), the actual stress hormone is cortisol. Those who know everything in this terminology and do not need to refresh anything, I apologize for the boring text. Acute stress response in this sense is not just a primary shock, but a minute-to-hour alarm during which an individual mobilizes his or her strength for survival. If stress stress (more precisely an alostatic burden , Mcewen2000aal ) does not exceed the body's adaptation range, adaptation - adaptation occurs. The stress response enters the adaptation phase . In the adaptation phase, the body is less conserved but tolerates a sustained burden - it compensates for the stress response. The level of stress hormones (mainly cortisol) is increased. We are talking about compensated load . Depending on the individual's resilience, the adaptation phase may take varying lengths. When the physical resources of the organism are depleted , the phase of exhaustion - decompensation is called. Load is no longer offset, homeostasis or even death is collapsing. The extent to which an organism is able to withstand the burden is called an adaptation range . If the load is sustained for a long time, the depletion and decomposition phase will not occur. On the contrary, there are adaptive changes in the body - so sport is healthy. In contrast, chronic mental stress is not healthy because it unnecessarily affects the body with cortisol, which can contribute to weakening immunity , chronic depression , obesity and hypertension .